Our aim is simple, to create loyal customers who know we give them the right conveyor solutions at the right price. At A.S. Conveyors, our job is to know the conveyor market both here in the UK and the rest of the world and bring to our customers high quality products at affordable prices. Our conveyor systems carry full warranties, have full spare parts support and can even have service packages if required. We also offer some used and reconditioned conveyor systems too in some cases which can save you even more money. We don’t employ sales people, but we have friendly, knowledgeable people here to help you make the right decision from all the options available to you. We manufacture our own conveyors and also source from external manufacturers where we have formed good relationships over the years both in the UK and worldwide. We basically do the ground work to understand your application and bring you the right product for the right price. We believe in sharing information freely without making you submit any details you may not wish to at an early stage. Technical data sheets or catalogues can be freely downloaded where available. If you then have any questions and want to make contact, we are always here to answer them. We don’t think prices should be secrets, we will be building pricing guides into the site in the near future and these will be illustrated wherever you see this logo. The prices shown should be considered as being for information only because there are many variables when pricing a conveyor system. Although these prices are intended to give you a guide to actual prices, they are real prices quoted to customers or are indeed prices as sold to customers. 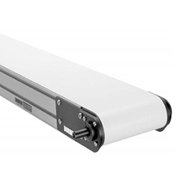 We know we can offer the best choice of conveyor systems available in the UK. We know that we can also offer the best value for money. We can back all that up by offering full warranty and servicing backup if necessary. Dorner conveyors carry a 10 year guarantee from date of fitment. Our other conveyor systems carry a 1 year guarantee. Qualified mechanical and electrical engineers are at your disposal should you require a full installation. All Dorner conveyor designs are engineered and tested to ensure trouble free performance and reduce the cost of ownership. In this way, Dorner can offer every customer an Industry Leading Warranty. No other company in the industry offers a longer warranty. A 10 year limited warranty to the original purchaser against defects in material and workmanship under normal use, proper maintenance and cleaning. We will repair or replace the defective parts. Normal wear is not warranted. Dorner is not responsible for labour, freight or duties associated with the replacement of defective parts. Unauthorised modifications to the equipment or using non-Dorner supplied replacement parts shall void the warranty. Equipment manufactured by others is covered by the original manufacturer’s warranty. Dorner does not warranty for merchantability or fitness of a particular purpose. Dorner does not warranty loss or damage to equipment, product, production, income, or profits and is not liable for direct, incidental, indirect, special or consequential damages, or any damages to persons or property. See the full Dorner Limited Warranty for coverage & limitations. Availabel on request. Industrial Conveyor Systems in the U.S.
Conveyor System Integrator in the U.S.